Location: No. 1, Jalan Madge, Off Jalan U-Thant, Ampang, 50400 Kuala Lumpur. 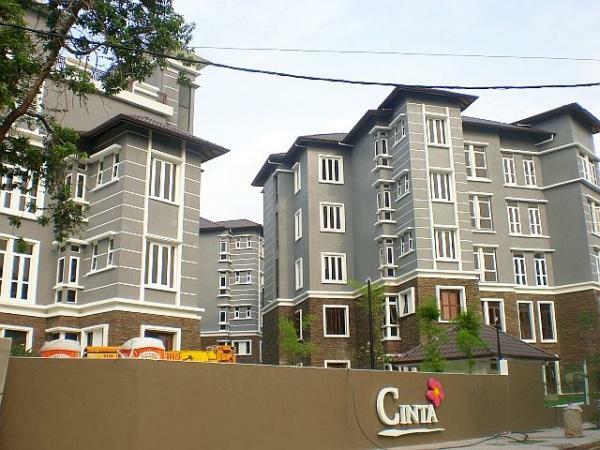 Cinta Condominium is a low density condominium located on the intersection of Jalan Madge and Persiaran Jalan Madge. This exclusive condo has a touch of European heritage design and is only available for rental, not for sale. It comprises of 5 condominium unique blocks with very large built-up sizes. Cinta is easily accessible via Jalan Ampang Hilir, Jalan Tun Razak and Jalan Ampang. It is just within a short driving distance from Bukit Bintang, KLCC and Ampang Jaya, were plenty of amenities can be found. Based in the golden-triangle area of Kuala Lumpur, Cinta is the absolute place to stay with the comfort environment, relaxing day and night heavens home. Kaseh 1 (Ground Floor) – 4043.10 sq.ft. Kaseh 2 (Ground Floor) – 4105.10 sq.ft. Kaseh 3 (Level 1) – 4043.10 sq.ft. Kaseh 5 (Level 2) – 4043.10 sq.ft. Kaseh 6 (Level 2) – 4105.10 sq.ft. Kaseh 7 (Level 3) – 4105.10 sq.ft. Kaseh 8 (Level 4) – 4105.10 sq.ft. Sayang 1 (Ground Floor) – 3969.9 sq,ft. Sayang 2 (Ground Floor) – 4161.5 sq.ft. Sayang 3 (Level 1) – 3969.9 sq.ft. Sayang 5 (Level 2) – 3969.9 sq.ft. Sayang 6 (Level 2) – 4161.5 sq.ft. Sayang 7 (Level 3) – 4161.5 sq.ft. Sayang 8 (Level 4) – 4161.5 sq.ft. Mesra 1 (Ground Floor) – 4981.7 sq,ft. Mesra 2 (Ground Floor) – 4945.1 sq.ft. Mesra 3 (Level 1) – 4981.7 sq.ft. Mesra 5 (Level 2) – 4981.7 sq.ft. Mesra 6 (Level 2) – 4945.1 sq.ft. Mesra 7 (Level 3) – 4945.1 sq.ft. Mesra 8 (Level 4) – 4945.1 sq.ft. Asmara 1 (Ground Floor) – 4994.6 sq,ft. Asmara 2 (Ground Floor) – 4769.6 sq.ft. Asmara 3 (Level 1) – 4994.6 sq.ft. Asmara 5 (Level 2) – 4994.6 sq.ft. Asmara 6 (Level 2) – 4769.6 sq.ft. Asmara 7 (Level 3) – 4994.6 sq.ft. Asmara 8 (Level 4) – 4994.6 sq.ft. Berahi 1 (Ground Floor) – 4011.80 sq,ft. Berahi 2 (Ground Floor) – 4011.80 sq.ft. Berahi 3 (Level 1) – 4011.80 sq.ft. Berahi 5 (Level 2) – 4011.80 sq.ft. Berahi 6 (Level 2) – 4011.80 sq.ft. Berahi 7 (Level 3) – 4011.80 sq.ft. Berahi 8 (Level 4) – 4011.80 sq.ft. – Study room, jacuzzi room, lanai, drying yard, balcony, kitchen area, centralized air condition and built in wardrobe and cabinet. Floor plan available, contact Vivian 012-3847410 for more details.